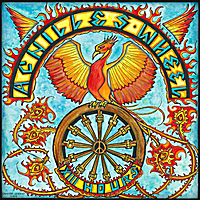 Achilles Wheel is a relatively new band, fronted by 2 persons/authors – Paul Kamm and Johnny ” Mojo” Flores. The 13 songs from its debut album were recorded in precisely 13 hours, live at historical ” Nevada Theater”, in downtown Nevada City, CA. In best possible way USA act combines jam rock options with roots music legacies.